Cockney-Yiddish music hall songs from the turn of the twentieth century: quirky, moving, edgy and comic songs that offer glimpses of an impoverished, energetic and conflicted community trying to acculturate to their new home without losing their identity. 13. Vos Geyst Nisht Aheym Sore-Gitl? Freg nit kayn katsha’nes, es iz england. From songsheets tucked away in dusty archives across the world comes the Cockney-Yiddish music-hall repertoire. These songs have not been heard for the last hundred years, and they open a window into the past. Telling of religious tension, pressures of sweatshop work and sexual dalliance with the lodger, these feisty, moving, funny and irreverent songs portray aspects of life for Jewish immigrant workers in the East End of London at the turn of the Twentieth Century. The material is performed and arranged by Katsha’nes. Some songs have known melodies, others have original music composed by the band. 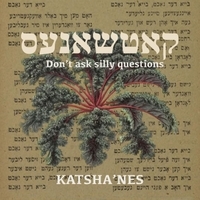 For two years Katsha’nes’ multimedia performance of songs and sketches has been entertaining audiences in the UK. Now their songs have been produced on this exuberant debut CD Don’t Ask Silly Questions. Updated with extra words, new music and topical references, the parallels are all too clear and the edgy humour still pertinent today. The CD comes with a booklet packed with lyrics, translations and historical context. Vivi Lachs of the longstanding Klezmer Klub, has been singing Cockney-Yiddish songs for almost a decade. She completed a PhD at Royal Holloway on Yiddish popular culture of London before the First World War. Her research will appear in the book Whitechapel Noise, published by Wayne State University Press in May 2018. An experienced teacher, she gives lectures internationally and leads East End historical tours in song. Sarha Moore of the internationally renown Bollywood Brass Band, is a saxophonist specialising in performing popular music from around the world, particularly in street bands. Her performances include klezmer, Indian, African, Latin American and jazz musics, playing at festivals, celebrations and processions internationally. She recently completed a PhD in world music studies. Flora Curzon, from Sam Lee and Friends fame, started the violin aged four. She recently graduated from the Royal Academy of Music, where she developed a passion for small ensemble playing. She now enjoys a wide range of musical opportunities from orchestral and chamber music making, to many styles of folk and improvisation, most recently as Fran and Flora. Rebekka Wedell, music director of Kingston Liberal synagogue, is a composer, singer and pianist who trained at the Guildhall School, London, and in Jerusalem. She performs Jewish liturgical, secular vocal music, and classical repertoire. Her compositions include acoustic and electronic vocal works that reflect her interest in music theatre. She explores the themes of cultural memory and identity, disruption and fragmentation.